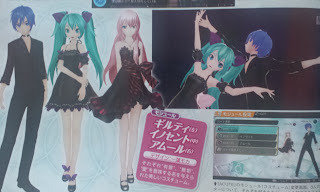 Recent magazine scans have revealed new modules (costumes) that will be featured in the upcoming Hatsune Miku -Project Diva- F PlayStation Vita rhythm game. "Agitation," "General," and "Bad Boy" modules designed by Nagimiso, "Guilty," "Innocent," and "Amour" modules designed by Ichiyou Moka, as well as swimwear modules were previewed in the pages. 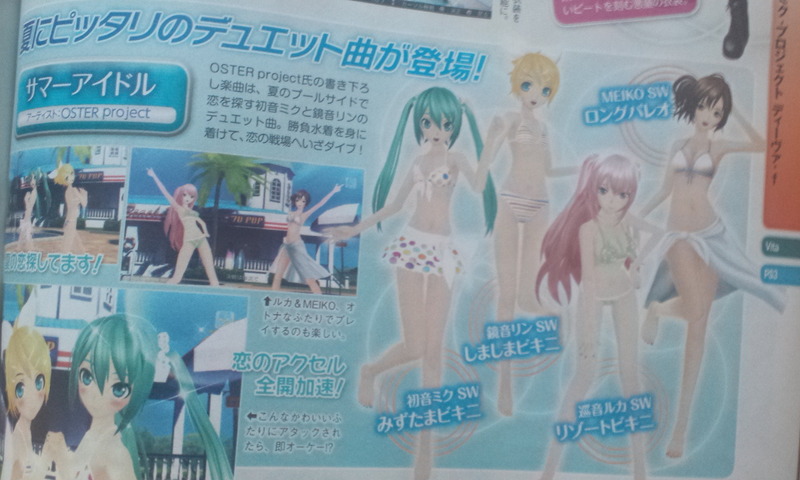 The swimwear modules were also shown in a recent preview video for the song "Summer Idol" by Oster Project. A video previewing eight new songs was posted last month. 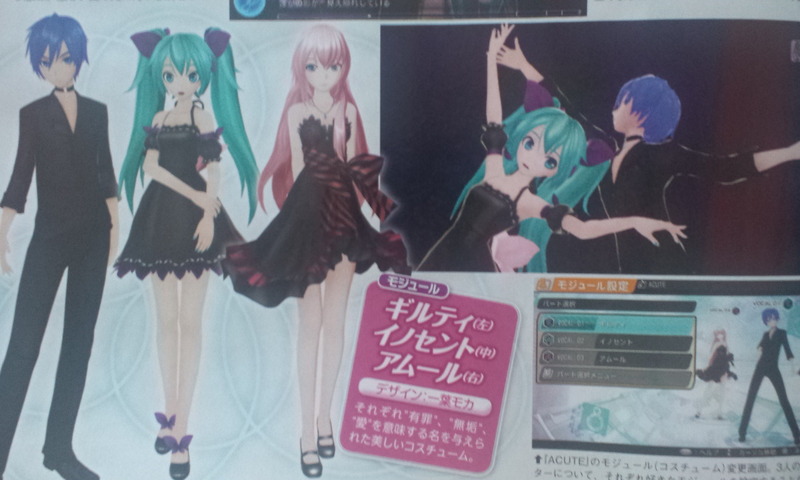 The game will feature an AR mode that uses the PS Vita's camera to superimpose Hatsune Miku in the real world. 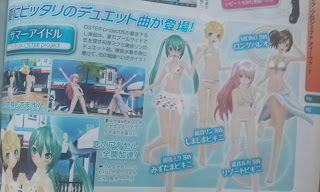 Sony will release a PlayStation Vita Hatsune Miku Limited Edition in Crystal White as a bundle with the game on August 30. Regular editions of the game will also ship on the same day. 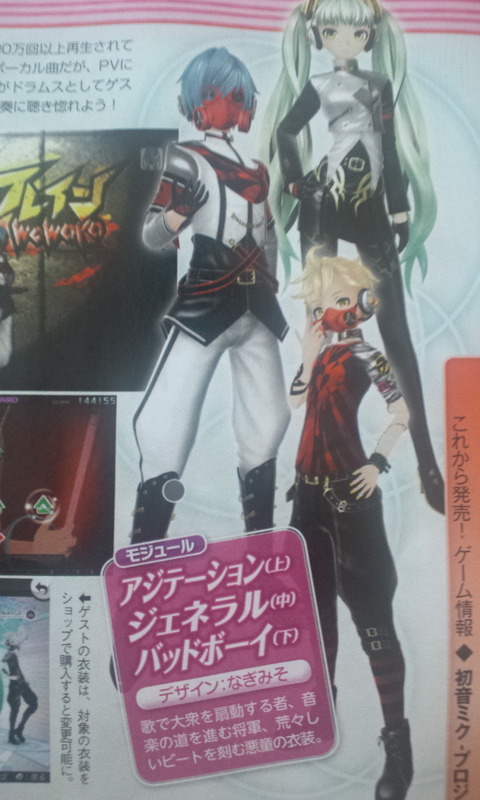 The PS Vita Card version will cost 7,329 yen (about US$92), and the downloadable version will cost 6,600 yen (US$83).